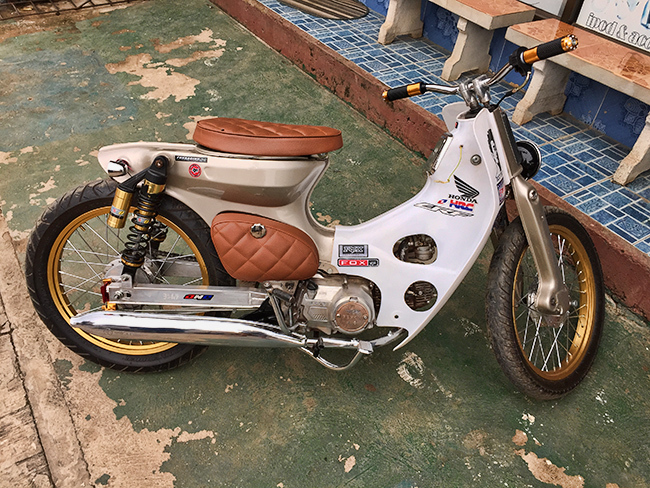 So you want to travel from Vientiane to Udon Thani or Bangkok? You can do it easily and get a bus from one of the travel agents. 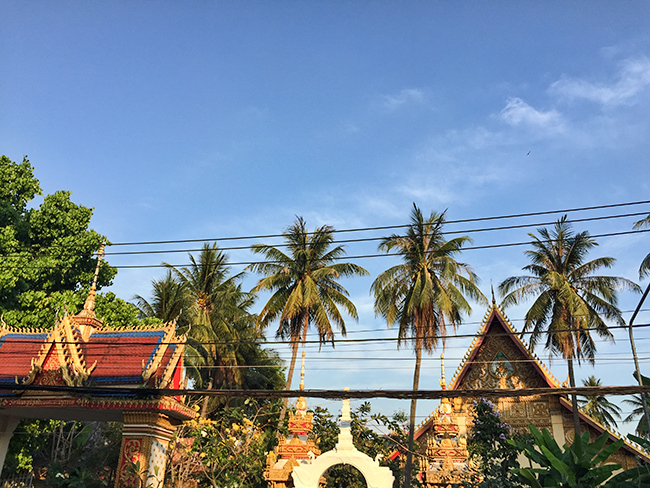 To Udon Thani they asked 60.000 Kip in March 2015. No clue why that is so expensive. 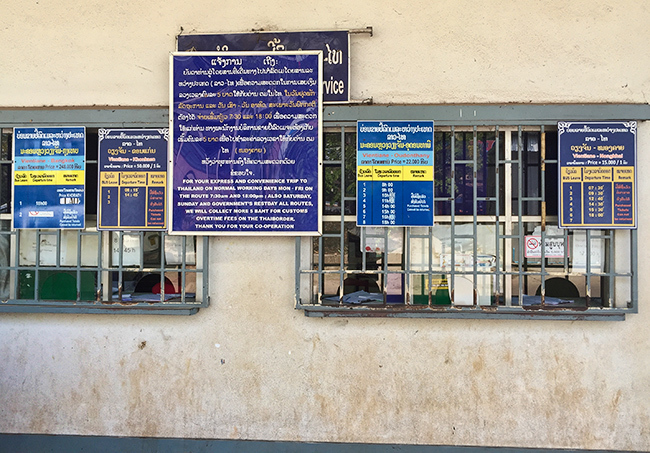 At the bus station in Vientiane, a ticket to Udon Thani is 22.000 Kip and you have the choice of 8 different departure times. 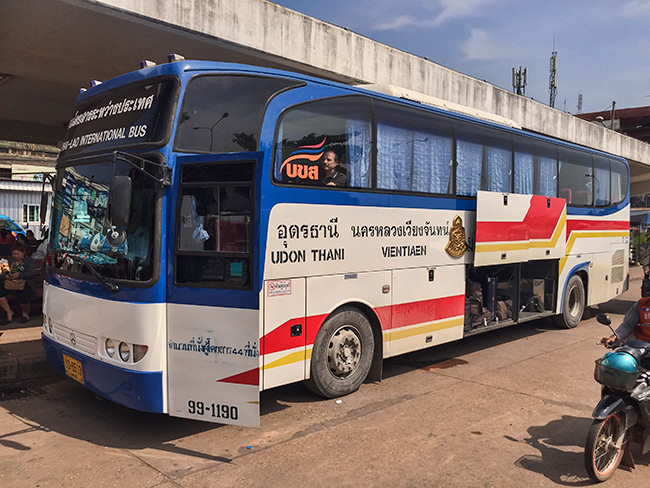 In Udon Thani you can choose from a big variety of buses to Bangkok. I had a VIP 1 + 2 for 583 Bath from Udon Thani to Morchit bus station. 1 + 2 means you have one seat on one side of the bus and two on the other. Thus resulting in wider seats and yes they where massage seats as well. There are 24 Seat VIP buses so you have a lot of leg room and there are some with more seats. The more seats the less space! 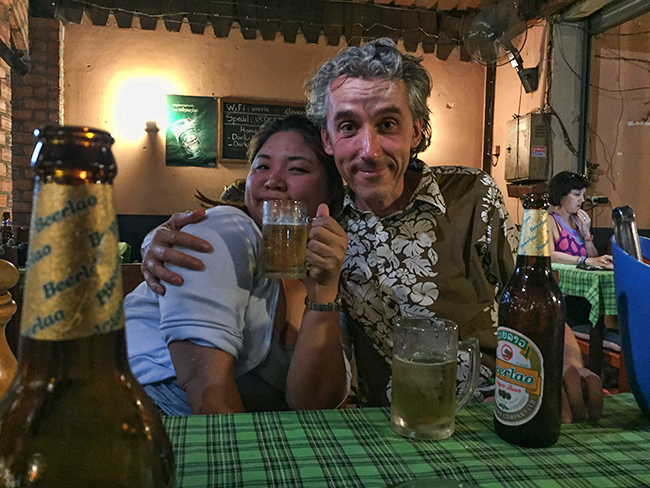 The Tuk Tuk drivers wanted 30.000 Kip to haul me to the bus station. After I was laughing he dropped the price to 20.000 Kip. Sound still a lot for 1.3 km! After 15 minutes – not including a Baguette and shake stop I arrived at the bus station and got my ticket. 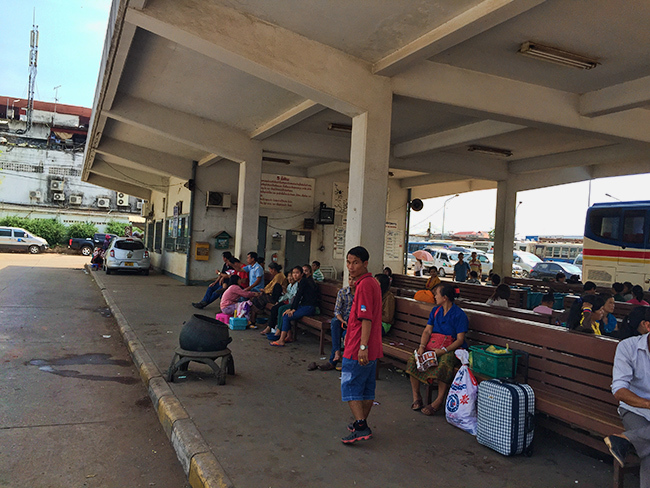 When you enter the bus station you see the ticket counter on the left. 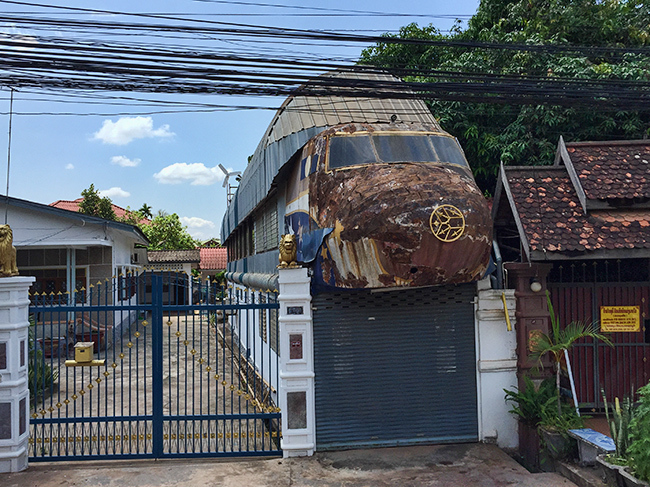 And on the right of the picture, you see the bus that will take you to Udon Thani. It is the right window where you get your ticket. Here are the bus times – they do change from time to time so you might check the day before if you think to have the last bus. And if you check – get that ticket anyhow. 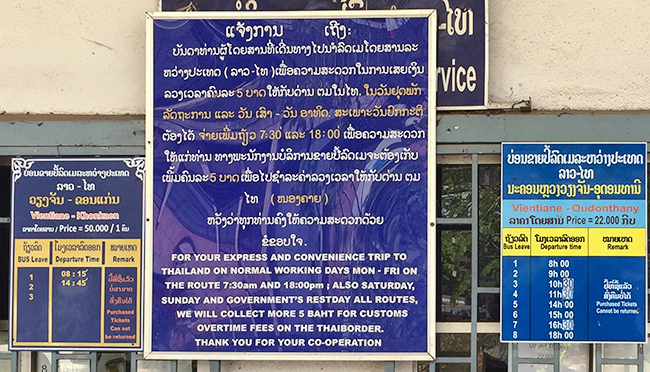 Beware – the first and last bus, as well as all the buses at the weekend, require you to get an extra ticket for customs at the Lao side of the border. They do not do anything – at last, I could not see them doing anything else – than selling you that ticket. This is the border bus. 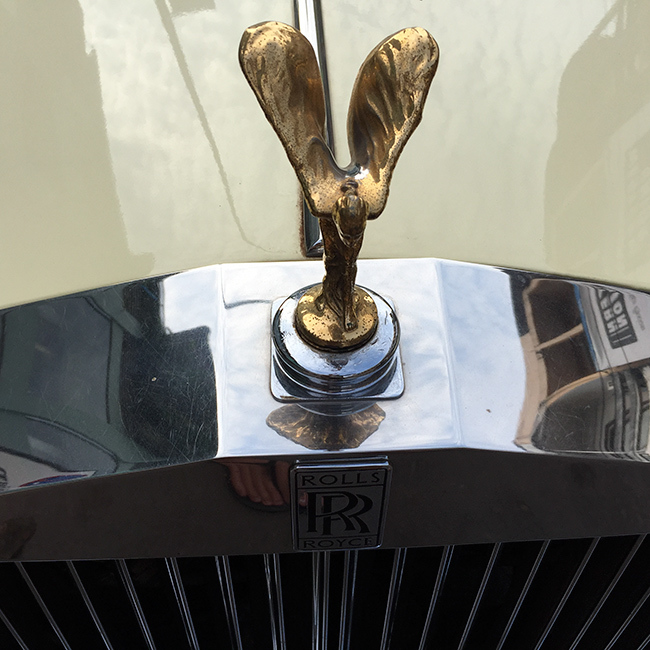 Guess there are a few – yours might look different. When the bus arrives at the border you have to take your all your luggage and proceed to the immigration. In case it is weekend or you are on the first or last bus – get the ticket for custom. 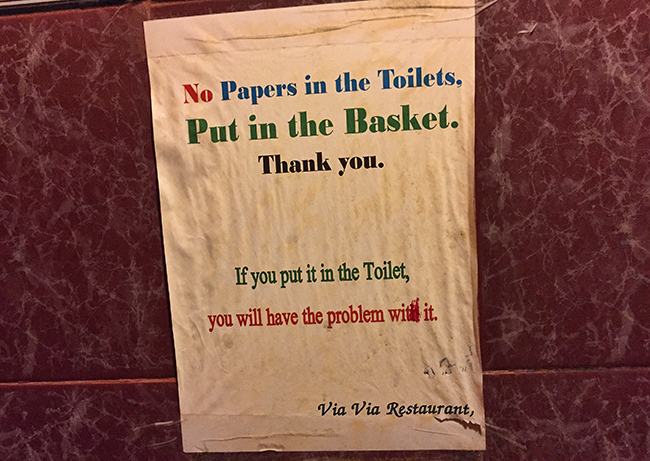 Check out of Laos. Get back on the bus. 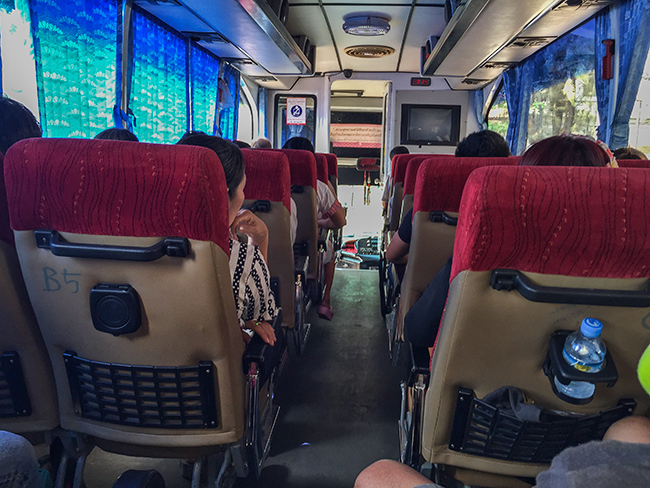 The bus drives you to the Thai immigration where you get out with your luggage again. Then you pass immigration and get back on the bus. Next stop is the bus station in Udon Thani. The trip took 3 hours but it could be longer – depending on traffic or how many people are queuing in front of the counters at the border. Do you want to stay up to date and not miss a post? Subscribe to the blog on the top left or under this post! 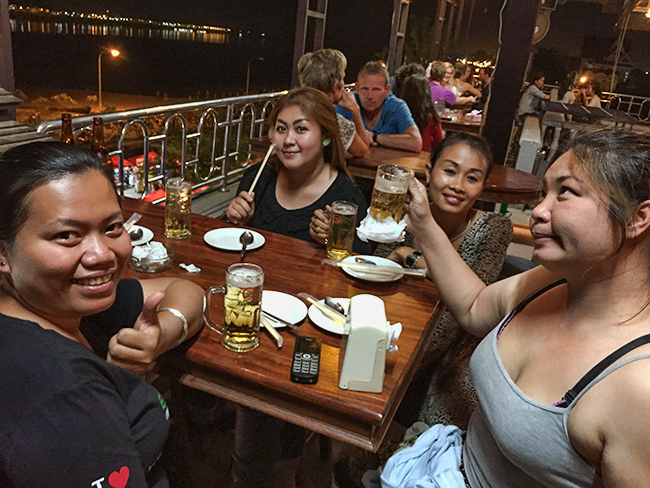 Since I wanted to meet friends in Vientiane Friday night i had to get down there. Took the VIP bus for 50.000 with a pick up in town. That worked quite good and the best thing was that the bus did stop opposite the Mixay Hotel. That was the hotel where I wanted to stay anyhow. Great! They even had a free room. And a basic breakfast as well. Did come to 60.000 kip for a fan room with a single bed, table, chair, mirror and a cabinet. Fair enough. Did try to find a decent place for a sandwich or some local food. Turned out not to be too easy. But I did find that little one. 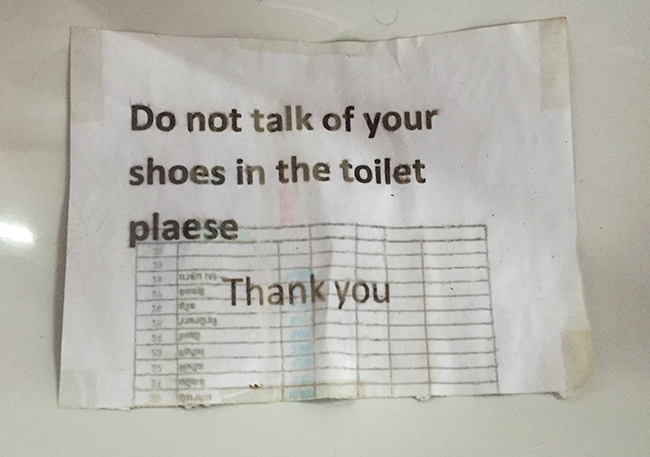 I guess they wanted to say “Do not take your shoes into the toilet” but that sign is rather confusing! Phonekham and his brother did drive me to the temple and we had a soup before we went there – cool garage at the other side of the road. 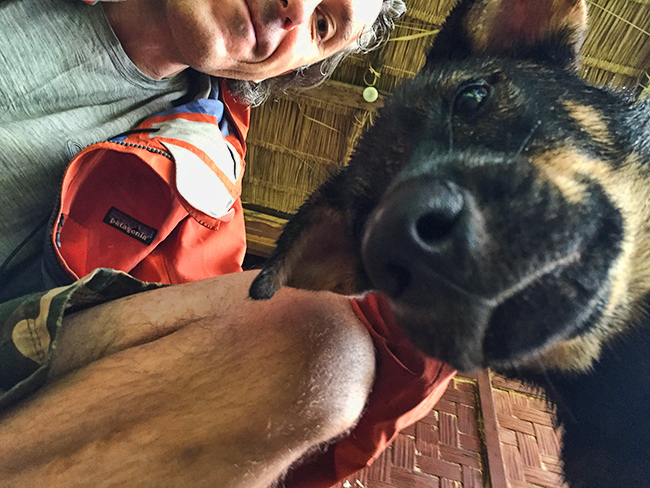 My friend Moritz died 2 years ago in Pai. Some of you might still remember. Somehow his ashes ended up in a temple in Vientiane. Well the Thai police did send the body down South and Phonekham went over to Thailand to organize the cremation in a temple over there. 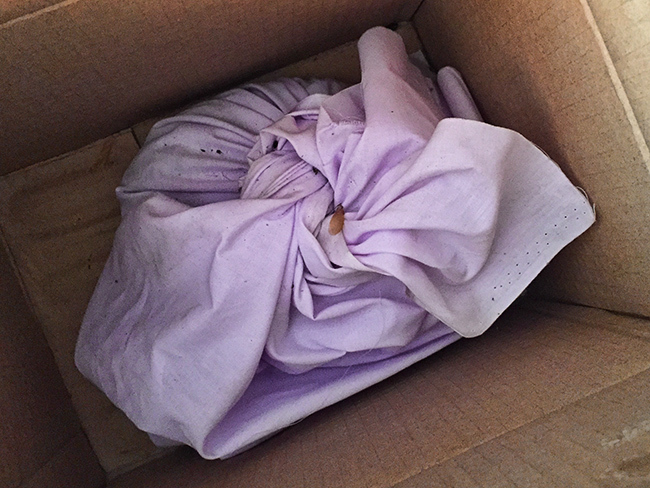 Than he got a box with the ashes in a plastic bag. 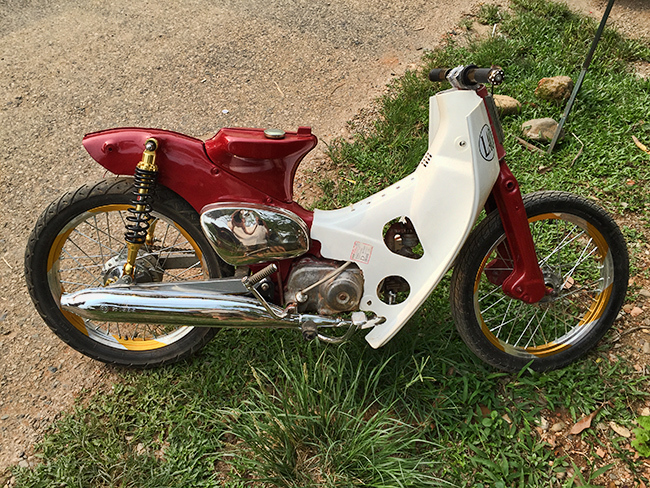 He went back to Vientiane than and stored it in a temple. That is why I am here now – taking care of the last step. But before that I have to get the ashes first. 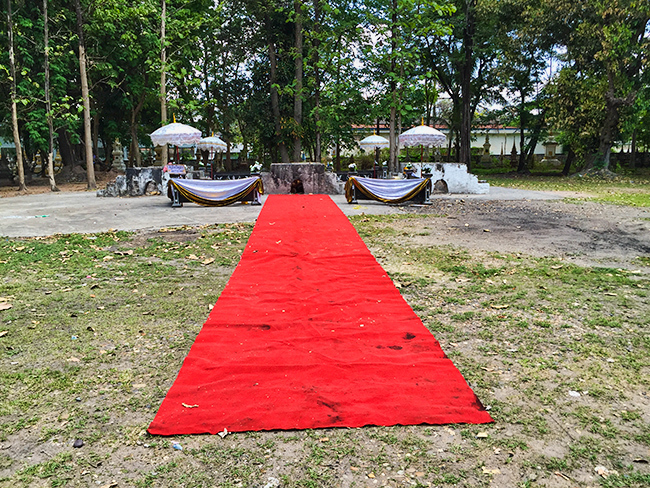 Coincidence – there where preparing another cremation a bit later in the day. 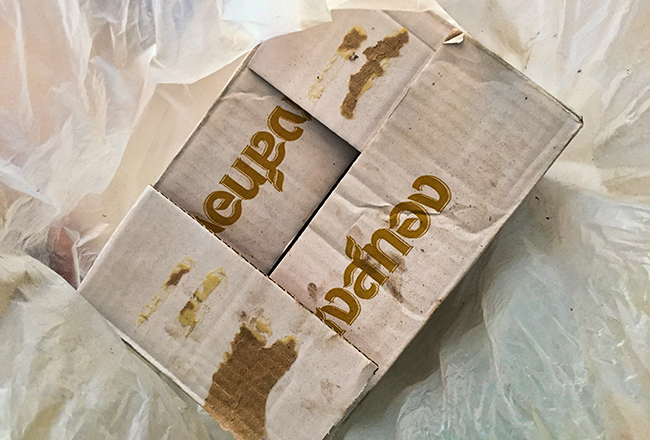 Look look the box. Interesting – they did put him into a Hong Tong box. A Thai whiskey brand. If you ever collect me can you make it at last a premium whiskey? Not a lot inside – that is all there is left. And some Thai paperwork which I can not really read. Thank you Phonekham for taking care the last 2 years!! Back to more happy happy again. 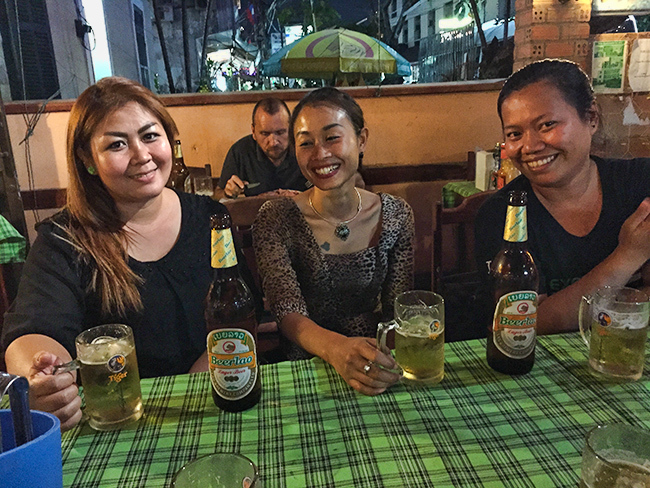 Nong from Thailand came over for a night to visit. She was lucky since her friend Noy did pick her up from the bus station. The 2nd hotel she was asking had a room for her and then we went for some food. The view from our table – very nice! 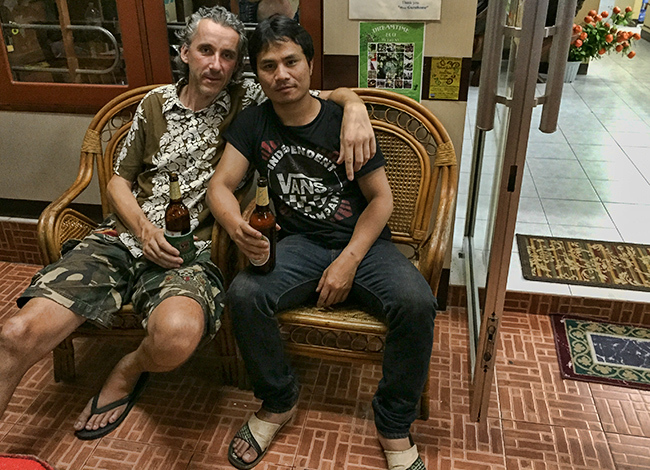 On to the next bar and then another one to meet with Phonekham, his brother and another dude. Lao soup the next day. Soooo god. If you find a local place – make sure to get one. They only sell soup so you can not get confused. 10.000 to 15.000 kip. Thursday night Phonekham dragged his brother and me in the club – this video gives you an idea about the show over there. 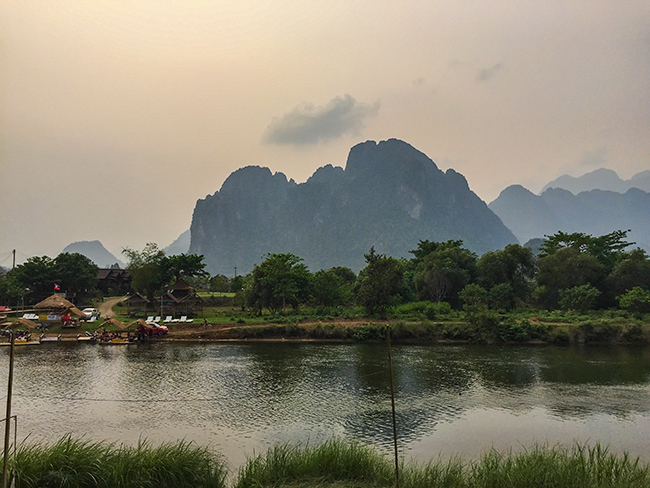 A few days in Luang Prabang before I took a minibus down to Vang Vieng. 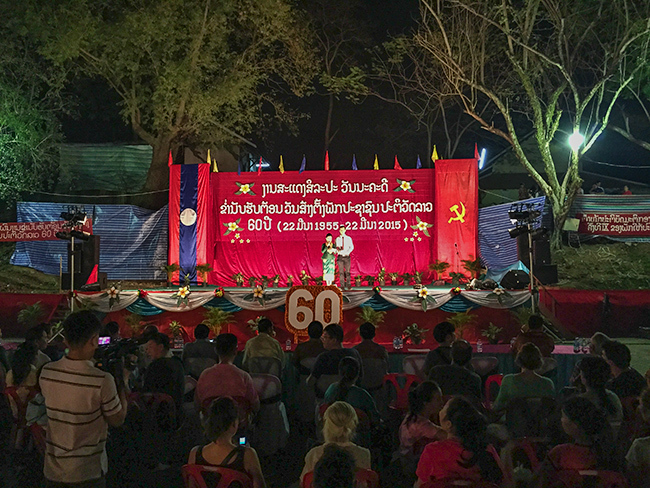 60 years Lao People’s Revolutionary Party! 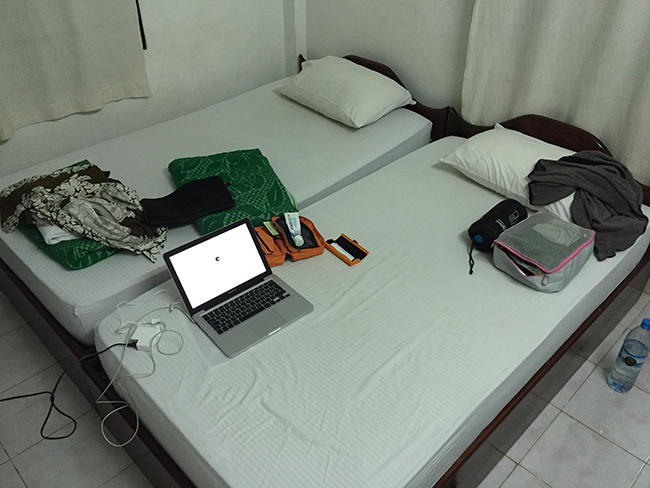 After that looong day on the boat I was happy to arrive in Luang Prabang. Took me about 30 minutes to find a room. The guy wanted 50.000 kip but when I turned away he went down to 40.000. That is about 4,50 € and it was a super room with fan, bathroom and shower. 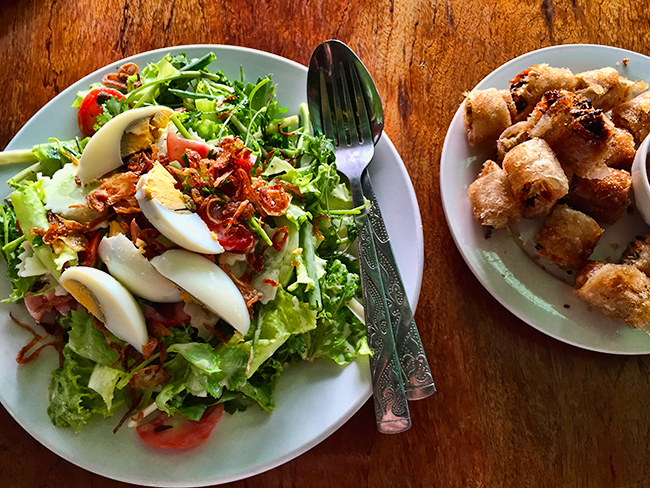 Wanted to have food at the place where I usually go when in Luang Prabang. But that is now a travel agency. Hmm, no shortage over here anyhow. 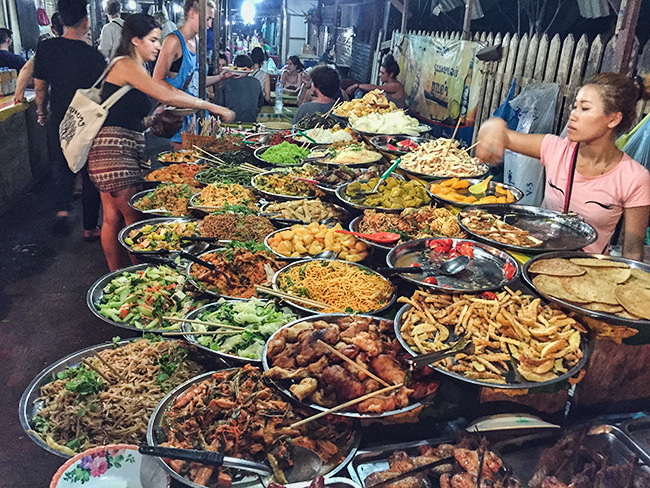 So I kept walking to the evening market and down the first little street where you find a lot of food stalls. 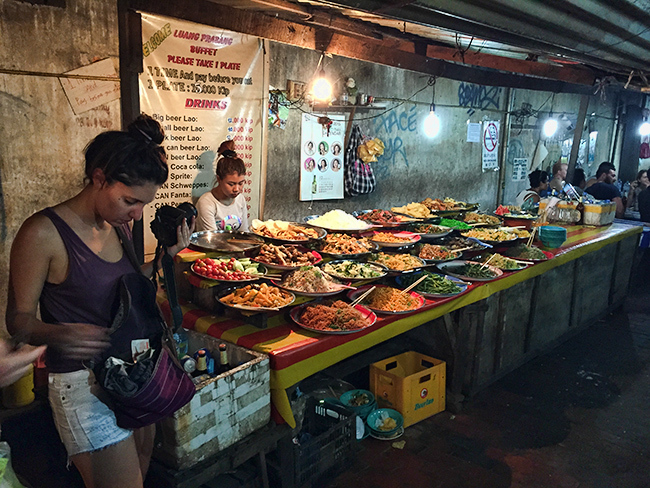 And you find the cheapest food in tourist city as well – that is if you really really manage to fill your plate. 25.000 – a bit over 3 €. I have no clue why the food in Laos is all of a sudden more expensive than Thailand. 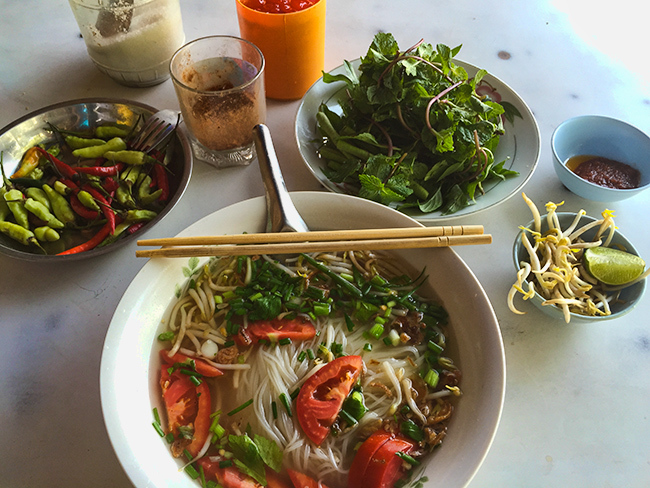 As long as you do not stick with a classic Lao soup at a street stall it gets really expensive. They have lots of vegetarian options – great! After a few days it was time to hit the road again. 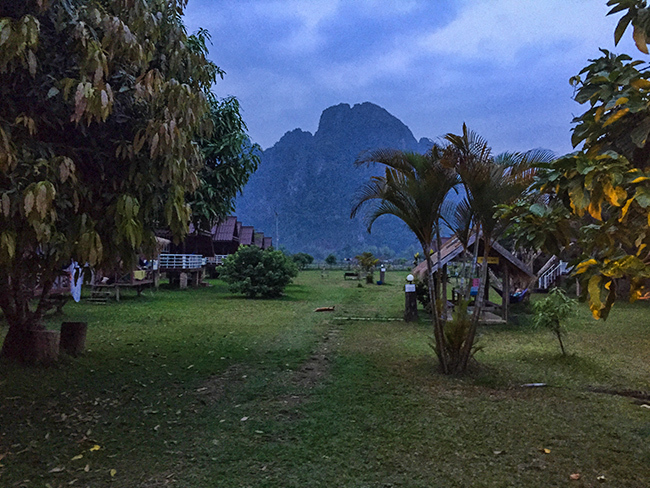 Sure enough it is way more expensive to drive down to Vang Vieng than up from Vang Vieng. Had a super group in the bus. At last the two rows in the front. Since we sat the whole day in the van I decided to walk with another guy to town. Stopped for a few beers to cool down and got bungalows over the river at Banana Bungalows. He wanted 50.000 each but after I asked for Student Discount we got ours for 40.000 kip. Thank you! As you can see – the smog was mixed with rain clouds today. And the rain switched on and off the whole day and night. So it was quite humid and everything in the bungalow gets kind of damp. Not really nice but I had a super mattress and could sleep quite well. 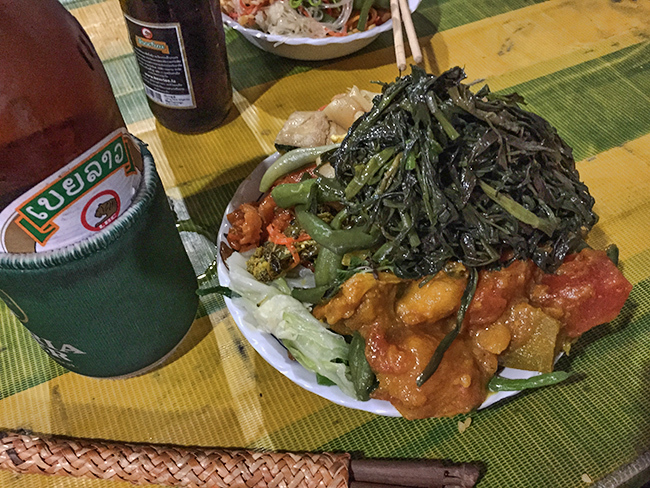 Really good salad – 30.000 kip – for 3,40€ you get something like that back home 🙁 There was nothing in the menu that said it does comes with eggs…. at last the “no meat” did work! This one – me take this one!!! Best dog at my side of the river! 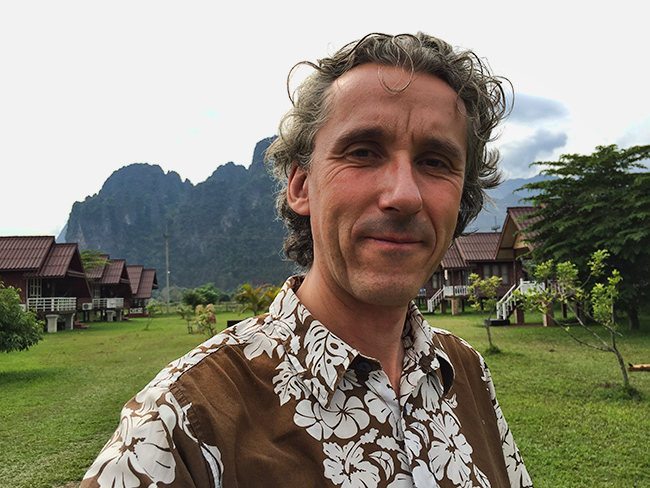 Good morning Vietnam – errrr Laos! 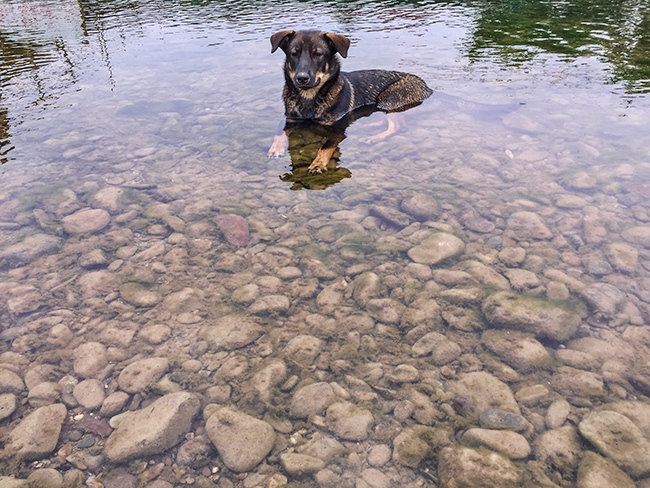 When it gets to hot – find a nice cool spot!